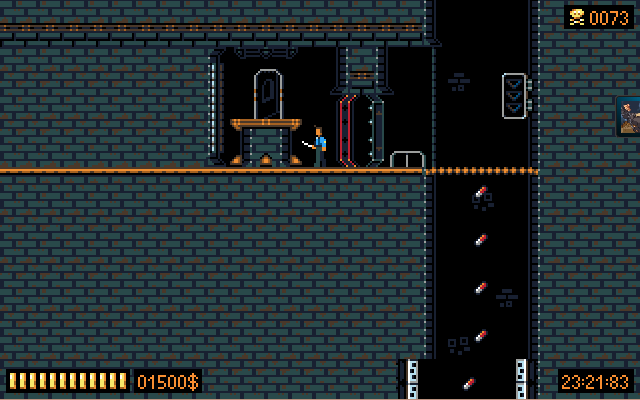 The Art of Dying is a really challenging platformer I've made in AGS. It features two difficulty levels (really hard and unbelievably really f*cking hard), a six level campaign and a full-featured level editor. So you can make your own levels, then share them and find others to download and try to beat yourself on the official level sharing platform: http://dkh.agser.me/die. The whole project is also open-source, so go ahead and take a look at the source - it's not in great state but it should be useful to some I guess! Gamepads and other external controllers are fully supported, although the controls work nicely on keyboard as well. Please let me know what you think! Refer to the readme-file for the credits and some important notes. You can rate the game over on the AGS gamepage. Have fun, prepare to die a lot and make sure to let me know if you managed to beat the game. Wow... I watched the dev diary just the day before it was released and I didn't imagine it to be so hard. It's the Mega Man effect, just without level checkpoints. You run, you jump, you run again, and then you jump into a projectile that would not have hit you and you think to yourself, "Why the hell did I jump there?" And then you start all over again, because it CAN'T be that hard, can it? Level 1 no problem, level 2 was hard, level 3 even harder, level 4 seems impossible already. On easy. 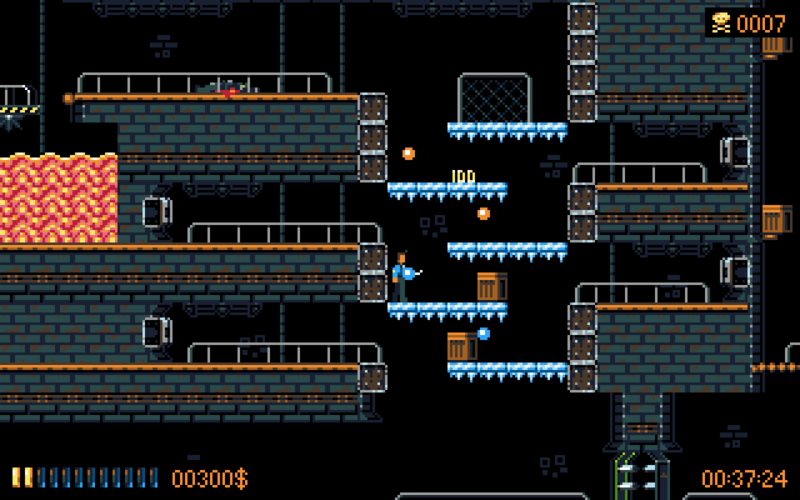 It reminds me of the jump'n'runs that I played on my C64, complete with retro chiptune music. I love it! The only thing I miss is the ability to duck or drop through floors while decelerating. I can't unzip the file, I get : "This is the first disk of a backup set. Please insert the last disk of this set"
It works also for me. The game is very polished! Congratulation for the released, DKH! I am not that sure that my numerous dying are of great artistic interest. Nothing About The Dog - Lema Sabachthani - You rock, Topus! I must have screwed up with my default unzip software...I know I did it before. This is amazing, I wish the controls in the menu would also allow the d-pad on the controller, but it's a minor issue. Other than that it's a really great game, amazingly balanced difficulty. Gratz! Holy cow this is awesome. Great job! Well made and polished. Great work! Thanks for the feedback everybody, glad you're all enjoying the game from the sounds of it! Let me know if you've beaten it on hard mode, because I've yet to hear from anyone who did! Great work, dkh, this is really enjoyable! I haven't even beaten the 2nd level on easy yet, but I'm already working on my third own level . The editor is really easy to use. I just wish there were checkpoints/spawning points. They would make longer levels less frustrating imo. Spectacular! Especially love the level editor idea! I hope to see some more AGS based editors from you someday! There goes my productivity... Currently on level four, many deaths and some shouting and swearing later. It's really quite an addictive game. also I tried my PS2 controller. The analog stick is recognised perfectly but not the D-Pad. But for precise control I prefer the D-Pad, any idea on how to do that? Or is it impossible with the plugin? This is so cool, and I'd love to play it with my 360 pad. Doesn't work though. Weirdly, when it is connected, the game doesn't react to me pressing the down arrow key in the menu or any other key. Only the up arrow key works. My older generic gamepad works fine though. Just found a minor bug: when you walk off a platform, you can jump mid-air, then double jump. FINALLY!!! After screaming for hours I finally beat the game on hard mode.